Botulinum toxin has been effectively used in the treatment of various spastic disorders such as cervical dystonia, strabismus, blepharospasm and facial nerve disorders. It is important to understand how this lethal toxin has been used to our benefit in providing relief to patients suffering from numerous intractable spastic disorders. Various electrical signals originate in the brain and trickle down various neuronal pathways in the spinal cord, through the spinal nerves to the neuromuscular junction (NMJ) and finally to the muscle cells which contract and cause the desired action. The chemical messenger that transmits these electrical signals across various nerve cells and neuromuscular junction to the muscles is the neurotransmitter, Acetylcholine (ACh). 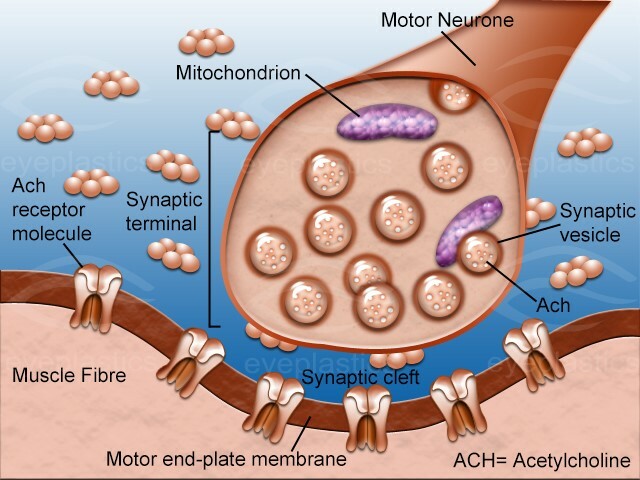 The acetylcholine binds to receptors on the muscle cells and causes the muscle to contract or shorten. Botulinum toxin blocks the release of Acetylcholine from the nerve terminal at the neuromuscular junction thereby preventing muscle contraction. This effect of botulinum causes paralysis or reduces abnormal muscle contraction allowing the muscles to become less stiff. Botulinum Toxin acts by blocking neural transmission at four different sites in the body - the neuromuscular junction, autonomic ganglia, postganglionic parasympathetic nerve endings and postganglionic sympathetic nerve endings, all of which release the neurotransmitter Acetylcholine. It irreversibly blocks the release of acetylcholine, the principal neurotransmitter at the neuromuscular junction, without causing degeneration of the nerve terminals. Hyperactive muscle contraction is caused by excessive release of Acetylcholine at the neuromuscular junction in certain disorders. Exaggerated muscle spasms are relieved by botulinum toxin providing reliable relief of symptoms. Botulinum toxin does not however provide a cure for the underlying disease process. The botulinum-induced irreversible paralytic effect starts in 24 to 72 hours and is complete in four to seven days after injection. There is recovery of muscle function only with the formation of new nerve terminals and new synaptic contacts which takes about two to three months. Binding of Botulinum toxin to the nerve terminal: Once injected, the toxin rapidly and firmly binds at receptor sites on cholinergic nerve terminals in a saturable fashion. The binding domain of the Botulinum toxin type A appears to be the heavy chain, which is selective for cholinergic nerve terminals. Internalization of Botulinum toxin: The toxin is internalized via receptor-mediated endocytosis through the synaptic recycling process. The plasma membrane of the nerve cell invaginates around the toxin-receptor complex, forming a toxin-containing vesicle inside the nerve terminal. After internalization, the light chain of the toxin molecule, which has been demonstrated to contain the transmission-blocking domain is released into the cytoplasm of the nerve terminal. 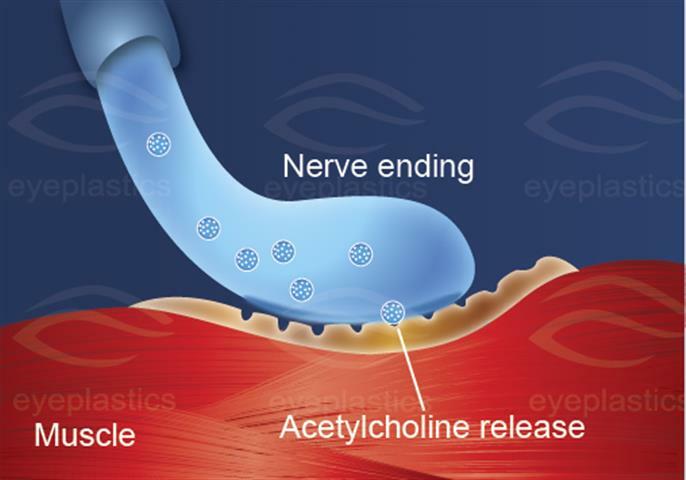 Blocking of Acetylcholine Release into the NMJ: Botulinum toxin attaches to the Acetylcholine-containing vesicles in the nerve terminal cleaving SNAP-25, a cytoplasmic protein that is located on the cell membrane and required for release of Acetylcholine. The affected nerve terminals do not release Acetylcholine into the NMJ and thus prevents contraction of the muscle. Why do you have to repeat Botulinum Injections? 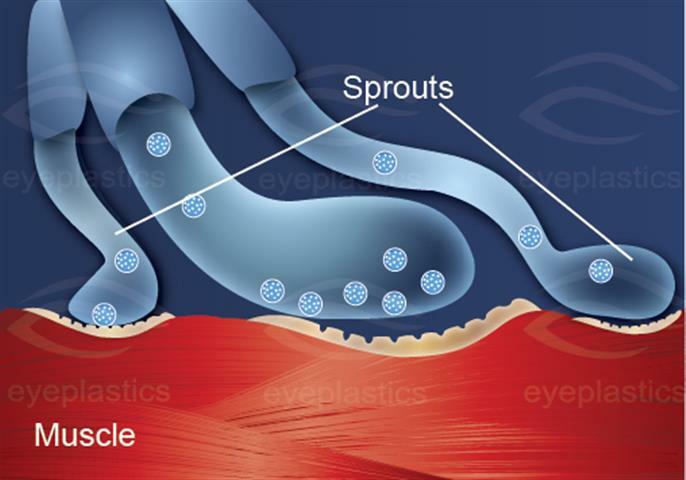 Nerve Sprouting is an interesting phenomenon in which new nerve terminals sprout parallel to the one blocked by botulinum and establishes new neuromuscular junctions. This results in a gradual functional recovery of the neuromuscular junction. Newer research suggests that the nerve sprouts retract as the original nerve terminal regains its function over time. This functional recovery takes about 2 to 3 months. The phenomenon of Nerve Sprouting is important because once functional recovery is complete, repeat injections should be given to maintain the desired clinical effect. Hence, repeat injections should be given every three or four months based on individual response to therapy. It should be kept in mind that tolerance to the drug develops with repeated injections due to antibody formation. Therefore, it is advised that the lowest effective dose be given as infrequently as possible. Normally your brain sends electrical messages to your muscles so that they can contract and move. The electrical message is transmitted to the muscle by a substance called acetylcholine. 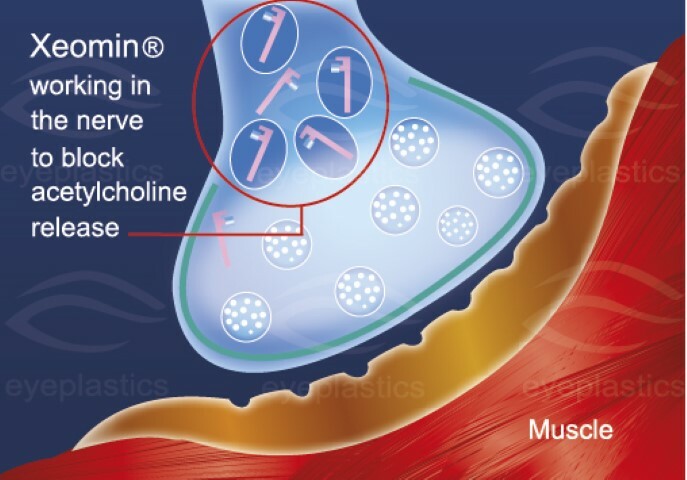 Botulinum works to block the release of acetylcholine and, as a result, the muscle doesn't receive the message to contract. What Characterizes hyperactive muscle contraction? At a normal neuromuscular junction, a nerve impulse triggers the release of acetylcholine, which causes the muscle to contract. Hyperactive muscle contraction, regardless of the underlying cause, is characterized by excessive release of acetylcholine at the neuromuscular junction. 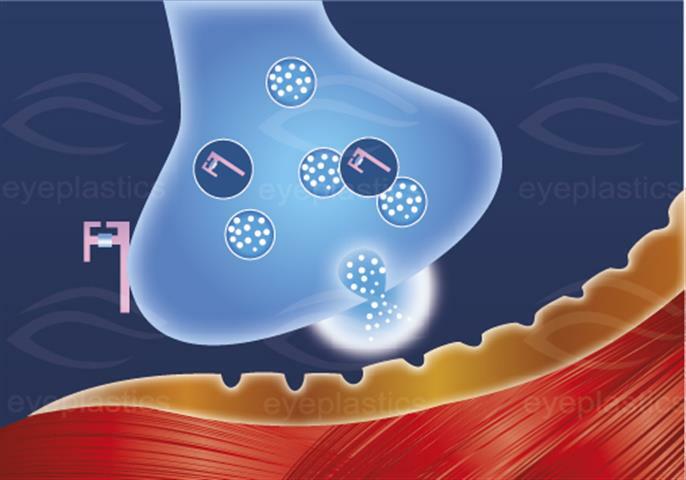 Botulinum toxin type A is internalized via receptor-mediated endocytosis, a process in which the plasma membrane of the nerve cell invaginates around the toxin-receptor complex, forming a toxin-containing vesicle inside the nerve terminal. After internalization, the light chain of the toxin molecule, which has been demonstrated to contain the transmission-blocking domain,5 is released into the cytoplasm of the nerve terminal. Botulinum toxin type A blocks acetylcholine release by cleaving SNAP-25, a cytoplasmic protein that is located on the cell membrane and that is required for the release of this transmitter. The affected terminals are inhibited from stimulating muscle contraction. The toxin does not affect the synthesis or storage of acetylcholine or the conduction of electrical signals along the nerve fiber. A nerve sprout eventually establishes a new neuromuscular junction, and muscle activity gradually returns. However, new research suggests that this new nerve sprout retracts and the original junction returns to functionality. Eventually, the new nerve sprouts retract and the original nerve ending regains its function. In either case, repeat injections of Botulinum Purified Neurotoxin Complex may possibly be required to maintain the desired clinical effect. The use of Botulinum can be effective in reducing this excessive activity. 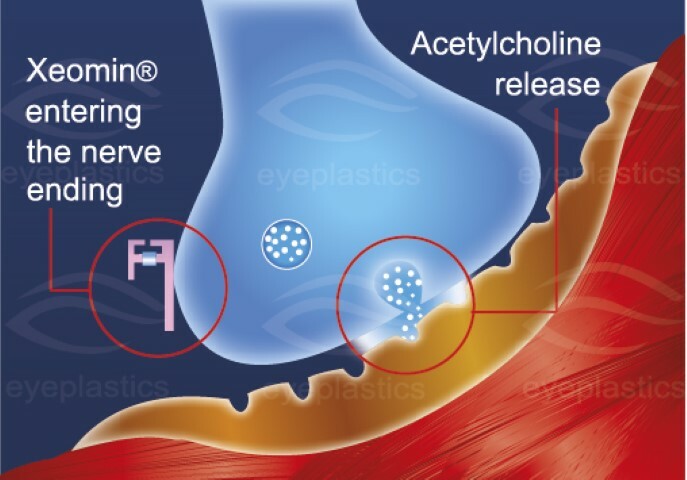 Botulinum is indicated for the treatment of strabismus and blepharospasm associated with dystonia, including benign essential blepharospasm or VII nerve disorders in patients 12 years of age and above.